True sustainability means considering our impact on the environment and the people making our clothes, so we choose our partners and materials wisely. 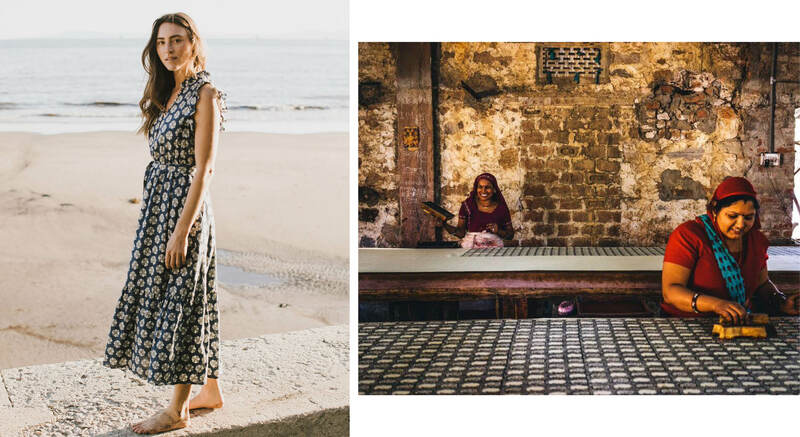 We are proud to work with our friends at Piece & Co. this season to source some incredibly beautiful textiles from small-scale artisan collectives around the world. Through thoughtful sourcing, we can empower these communities and keep their traditional handcrafting alive! Here are a few of the groups we worked with this season and the styles they helped bring to life. . .
“Because of our work with companies like Outerknown, these artisan groups can hold onto their heritage and make a viable income.” Todd Hanshaw, V.P. 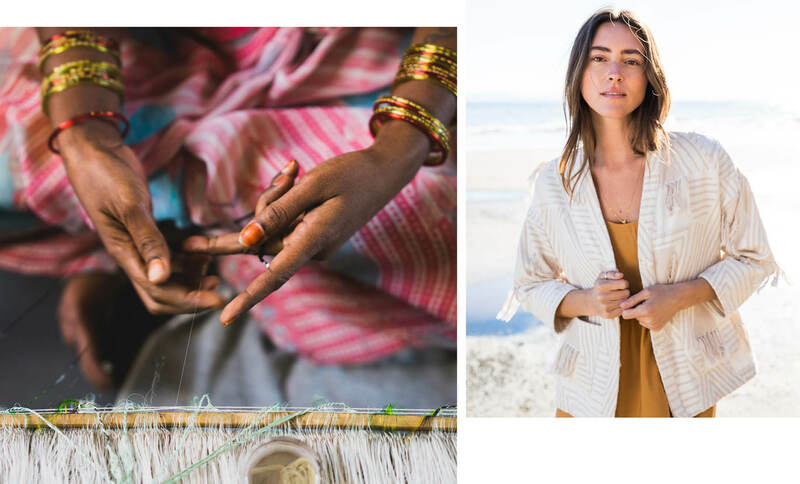 of Fashion Sales at Piece & Co.
Our Pacific Kimono jacket is a softly textured, wearable statement piece that showcases the incredible artistry of a female-led artisan group in the Tamil Nadu region of southern India, where weaving is a way of life. 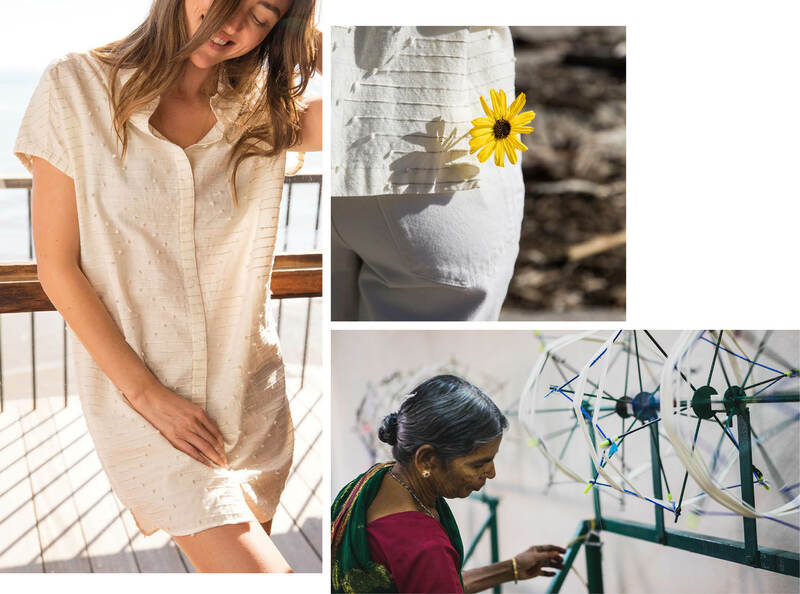 The cooperative was founded in 2007 by a female weaver who wanted to create opportunity in her community — thanks to a partnership with Piece & Co. and brands like Outerknown, this traditional way of life is now a legitimate livelihood. The facility is also SA8000 certified, which means a third-party (Social Accountability International) has verified safe and ethical working conditions. This beauty is made with organic cotton, woven on a super technical jacquard loom, used for complex weaves like this one. The subtle, textured lines of our Bee Shirt Dress and Sunrose Woven Tee add an artisan touch to these easy-wearing summer styles. This fabric is made by a GOTS certified artisan group nestled in the heart of Southern India, a region with a rich history in printing, weaving, and heritage hand loomed textiles. 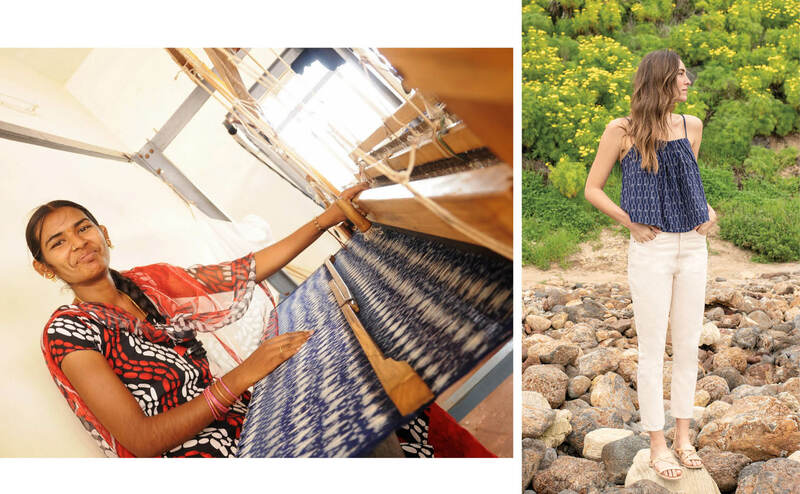 This artisan cooperative was founded in 2014 to revive a once-thriving textile industry by providing training and professional development for its employees. Now women make up the majority of the team. This softly textured dobby is lightweight, breathable, and just what you’ll want when the weather warms up. We paired some of our breeziest styles with a bold, organic cotton ikat for summer. It’s the imperfection and blurred lines of hand loomed ikat that we love most — the slight texture lends to an authentic and durable feel. Through our partnership with Piece & Co. we were able to source our ikat from an artisan collective near Hyderabad, India, the heartland of ikat weaving. Since 2008, this initiative has grown to employ over 2,000 artisan weavers, keeping their heritage as vibrant as their textiles. Traditional ikat is an incredibly intricate process — individual threads are carefully dyed with a pattern prior to being woven in one by one. We just can’t get over how beautiful this ikat turned out!